Do you fancy getting your hands on some Buy One Get One Free Bingo deals? With BOGOF Bingo you can do exactly that this month. The online bingo domain is carrying a host of great deals to throw your way, including a welcome bonus offer that can see you land more than many other bingo sites are prepared to offer. Join BOGOF Bingo right now, and you can pocket a more than smooth triple bonus. Players who deposit just a tenner into their BOGOF Bingo account can pocket a rewarding bonus worth £30 in all. This will see all new players start with £40 to their name. In order to qualify for these exciting offers, players need only deposit and spend a minimum of a tenner on bingo games. It is important to note that side games do not count towards to the total though. If you fancy a spot of free bingo, you can also snap that up at BOGOF Bingo. Free bingo games take place between 11.30am and 11.30pm each day, down in the free bingo room. The online bingo domain is equipped to offer you a share of £20,000 on the first Saturday of every month with their £20K Bingo game. Pop along to the Big Money Room from 10-11pm and you will be able to snap up those aforementioned deals. There’s lots more awaiting you too. 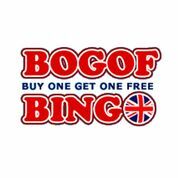 All you have to do is sign up at BOGOF Bingo to bag your bonuses. Of course, the best offer is the ability to bag two for one deals on bingo tickets, which is where the bingo site gets its name. Play bingo with BOGOF Bingo today, to pocket you share of these sensational offers and deals.